…a couple of days in advance. 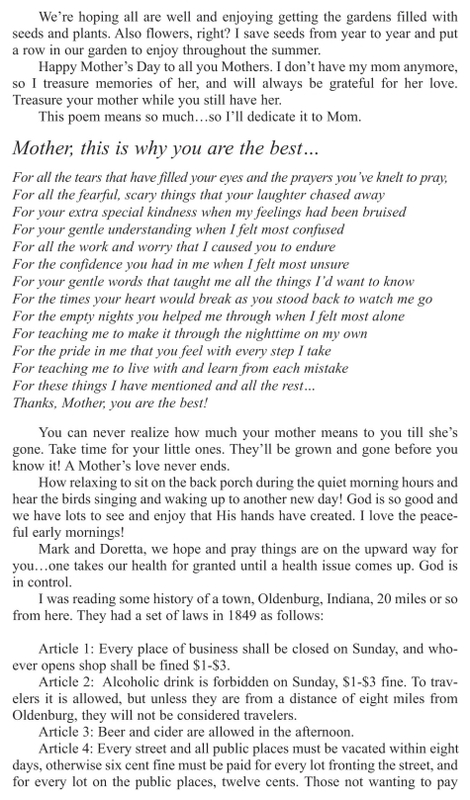 To celebrate the occasion, how about a Mother’s Day edition of Christina Stutzman’s Milroy Musings, from The Connection. And here’s one more column from a Connection mother, if you missed it. This is a very nice tribute to Mother’s. I appreciated reading it and wish my kids felt like the poem’s expressed feeling. I tend to think that the Amish show more kindness and gratitude to their parents than the english kids show. I hope all Mother’s everywhere have a wonderful Mother’s Day! Thanks Erik for posting this. It will touch many for this special day. Thanks, Erik for the Mothers Day tribute. It’s very thoughtful to think of us mothers & grandmothers. I agree with Lee Ann, that it appears the Amish children are more considerate to the elders generally speaking. I do like the idea of the dawdihaus so the “old folks” are looked after in their golden years. They have their privacy, but at the same time have someone close in case of accidents or illenss. Happy Mother’s Day to all the mothers reading Erik’s wonderful blog.